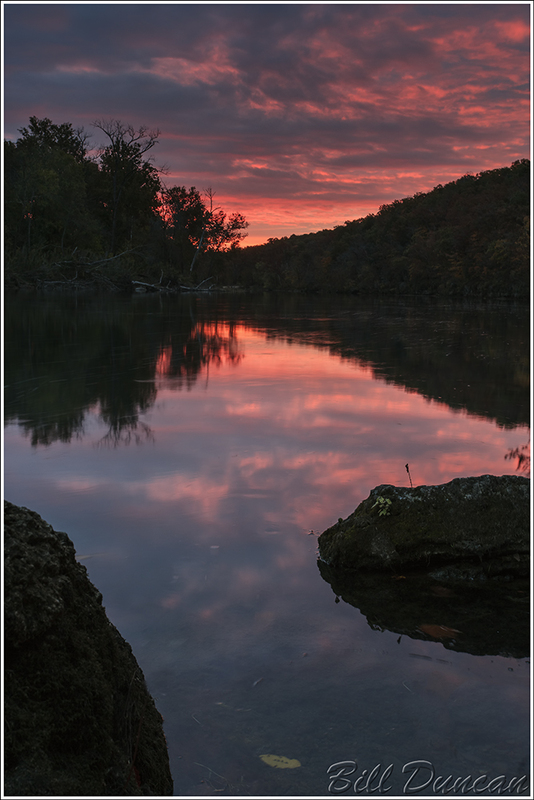 This year Sarah and I timed our autumn trip into the Missouri Ozarks perfectly. The autumn colors were near their peak and more spectacular than I can ever remember. 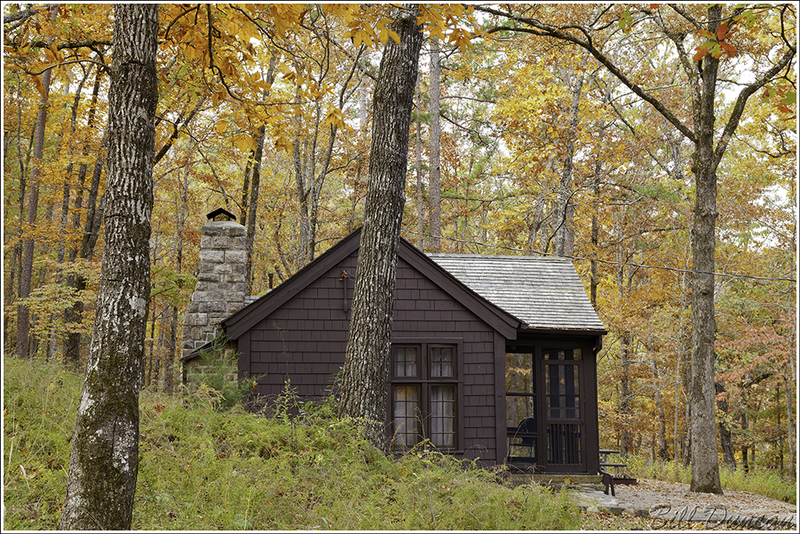 As is one of our favorite customs, we reserved one of the cabins at Big Spring State Park, located within the Ozark National Scenic Waterways. 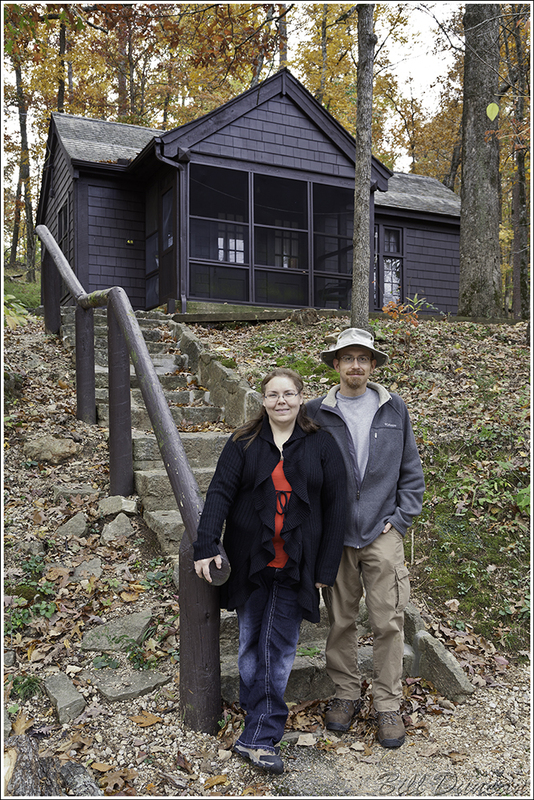 Built in the 1930s by the CCC, rustic is the perfect description for these cabins and the nearby lodge. We were a week or so earlier than normal this year and the cabins were a bit more full than usual, so we were not able to get a choice cabin that does not have a long flight of stairs. Once I got all the unnecessary equipment and supplies we carry up these stairs and inside the cabin, we were ready to have some fun. Located a few miles from the town of Van Buren, Big Spring is in contention for one of the largest springs on the continent, pouring an average of 286 million gallons (13 cubic meter/sec) a day into the Current River. I have never visited the spring without being mesmerized by the beauty and sense of peace that the spring presents as it flows from the base of the limestone bluff. 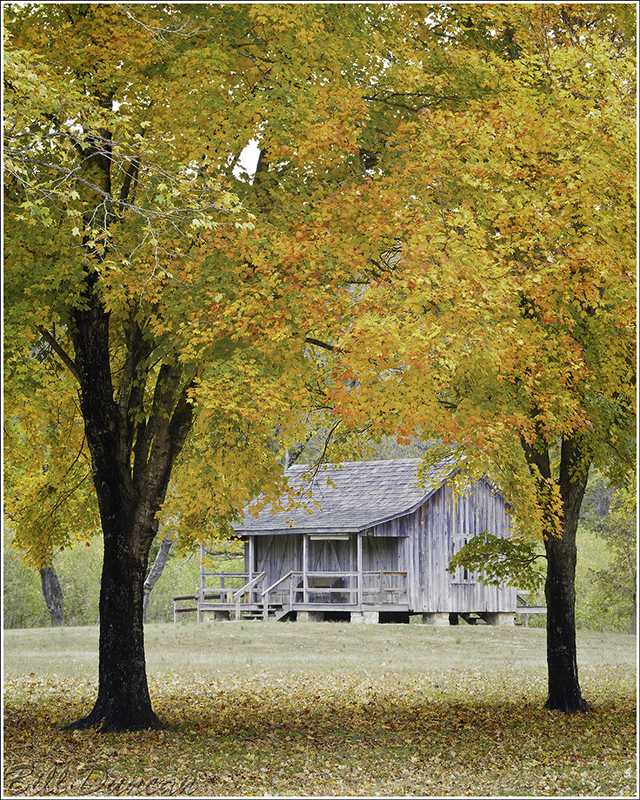 Autumn and spring time are by far the best times to make a visit. The cool blue waters that seem to come from nowhere contrast nicely with the warm autumn colors displayed by sycamores and other trees that take hold along the bluff. 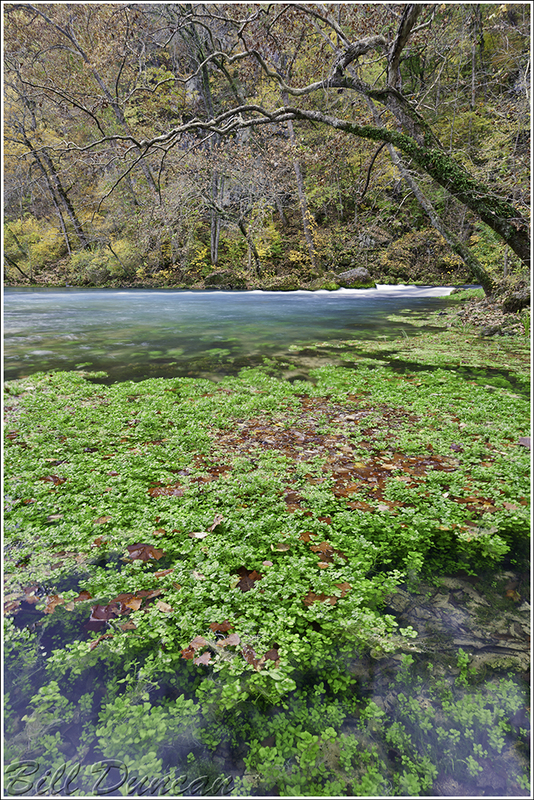 The image below showcases the watercress that is found here and in most of the large springs of the Missouri Ozarks. Although watercress is an exotic species, it is now naturalized across most of the country, and does not seem to present much of a problem with the delicate ecosystems that these springs create. Placed nearby the spring is this early Ozark settlement period structure. These maples frame it nicely. The morning this image was made was definitely memorable. I actually carried my bird/wildlife lens along with my landscape gear. Just past the confluence of the spring effluent, where those crystal-blue waters flow into the lazy Current River I eagerly watch the eastern sky. Will this finally be the morning I see some color? Yes indeed! However, just after setting up the gear and getting ready to capture this scene, an Eastern Screech Owl starts vocalizing maybe 20-30 yards up the wooded slope directly behind me. What to do!? Go after the owl in attempts to finally get a photo of that bird or take the sure thing of a quickly changing landscape? I decided to be satisfied with leaving the bird alone and concentrated on the sunrise while listening to one of the most beautiful songs imaginable. There was no real fog, but what a morning! So, there is a bit of detail and a few of my favorite images from this autumn’s Big Spring visit. It is surprising that so many people in the StL area have never even heard of Big Spring. But I’m not complaining. Let them take their expensive vacation to the popular destinations. If I can have this place to myself, as I almost always do on these morning hikes, I’ll be satisfied and want for nothing. Until the next time, I’ll be pining for my next visit home. How relieved are we that this place is protected? 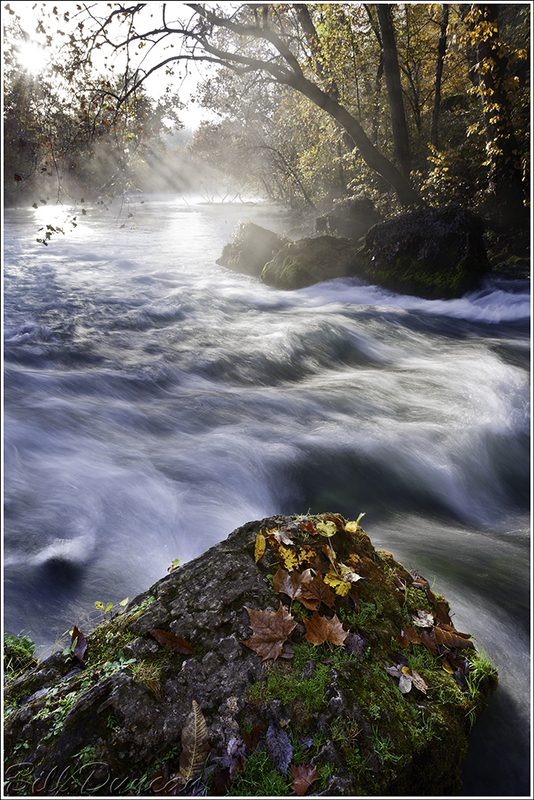 “Current River Sunrise” would otherwise be aglow with golden arches, along with a hundred other unmentionables. Beautiful work, Bill. Thank you. No kidding. There were likely plenty of opportunities for a variety of unthinkable “developments” during the past century. Fortunate indeed!